Up till now we just used a BlueTooth relay controller to turn things on and off, including the motors. We now have a real motor controller. This can do forward and backward and variable speeds. It is from the same company and is controlled similarly from bluetooth. It can also run off of 12 volts, so we just have to give it power from our 12 volt battery. So this does not need USB power. 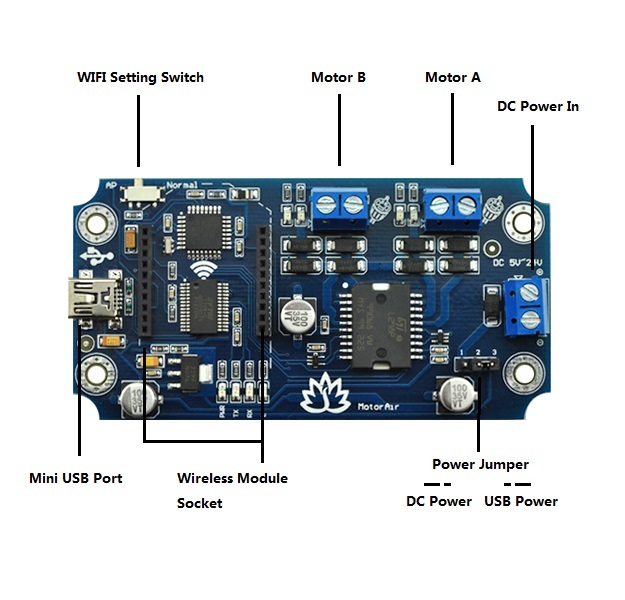 Here is the link for TinySine/MotorAir bluetooth dual motor controller. On my board the 'd' and 'e' are the two forward commands for a and b, and then 'f' and 'g' are the two backward commands for a and b. I have sent them an email on this. I think this is a brand new product as I could not find anything like it 2 months ago.